Good Morning! We started the day early after a late night, DH and I went with some friends to see the ASF production of West Side Story. It was really good and a fun evening with good friends. This morning though at 6am our baby, Lee, ( 18 yrs. old) left for the airport in Atlanta to fly to D.C. by herself. Yes, this Momma bear is a little anxious. She is growing up and I am very proud of her. She will be spending the week with her Aunt Kathie and Uncle Gordon; she is also visiting North Virginia Community College! 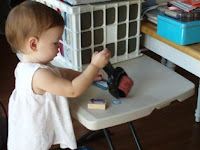 Okay enough family life, let's talk stamping. Yesterday's SCS Color Combo Challenge was Elegant Teal Olives- that's right Elegant Eggplant ,Taken with Teal and Old Olive. It was a challenge for me as the only Teal I thought I had was a marker. I did find some scraps of Teal in my old scrap box. I tried several things before this card emerged. I love this Baroque Motifs set. I think it came out great. Hope you like it. Babies are napping so I'm off to stamp. It's a Chocolate kinda a day! Do you every have those days where you'd just like to veg on the couch with your favorite glass of ice tea, with Sonic ice of course, and eat chocolate. I really felt that way today-couldn't do it, but felt like it. My good friend Karen has nicknamed Pellet ice from Sonic-"RTI" rat-turd ice. That sounds gross, but all of us call it that, even my 74 yr. old mother. My two babies, Cadie and Haley, start the day with " ice, Ice, ICe, ICE, CECE, ICE! I'm CeCe and RTI is their favorite thing. Well, for today's stamping project I actually did very little stamping. 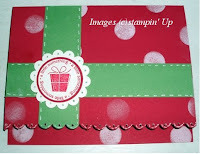 Just the tag was stamped with the new Riding Hood Red from Stampin' Up's new fall winter collection of In Colors. It is a very pretty red. The nugget holders were made with the new Bella Rose paper, the scallop circle punch and pink taffeta ribbon. These are great little party favors and very easy to make. Call me to book a workshop and we can make these for one of your projects. Hope you have a great Sunday. May God bless you real good. Remember that song from the 70's I think. Well, around here it's Saturday in the projects! Tommy is in the attic working on a "3 hr tour" but weather started getting rough, and his 3 hr. project of moving cable in the attic has taken three weeks! I am hoping, praying, and planning on organizing in my craft room so I can clean off the "dining room" table that one has eaten at in weeks. That project has not been started yet. I am also headed to Greensprings to help one of the residents decorate a big flamingo! Well enough rambling, I have a really cute card to show you today. It is called an ATC or artist trading card, they are often used for swaps because on their smaller size. This one was for the limited supply challenge at SCS yesterday. http://www.splitcoaststampers.com/forums/showthread.php?t=371092 The idea was to make a small card to tuck in your kids' or husband's lunch box or book bag for them to discover later. I used Brocade Blue with Barely Banana, Real Red and Whisper White. Sock Monkey is stamped on a 1 3/8 circle, colored and placed inside the card so he is peeking out the 1 1/4 circle punched out of the front. The tag is placed on dimensionals and the ribbon is attached with a silver brad. You won't believe Tommy still has a Sock Monkey his grandmother made him over 50 years ago. Well, hope you enjoy this card. Have a great day. Let's get together soon and stamp, stamp stamp! Good morning. It's the 8th day of the 8th month of 2008. Wonder if anything exciting will happen today? Of course, the opening ceremony for the Olympics is tonight. That should be exciting. Think of the babies born today, what a neat birthday! It will be easy to remember. I'm posting a picture of a nugget wrapper I made this morning. The DSP is Cutie Pie and it's almost gone. Monday is the big day. The new catalog becomes available. Call or email me. I have one with your name on it! The stamp is from the new hostess set Deer Friends! It is so cute and free with a 150.00 workshop or order. These make wonderful party favors. ( The nugget wrapper not a catalog) I took one to the beauty shop this morning for the wonderful Lady who cuts my hair. She loved it. Hope yall have a great day. I created this card today for the Card sketch challenge for SCS. The triangles and center rectangle were mandatory pieces. It was a fun project. I enjoy the challenges because they make me do something different; they give me a new place to start. Speaking of challenges, learning to publish a blog is no piece of cake. I have read more technical stuff in the last week than I have in years. So, please bear with me as I learn to do links and stuff. I try to make the titles links if it's appropriate. Thank you all for visiting me and for your sweet comments.The images used for this card are in the new Fall-Winter Catalog, the colors I am sorry to say are retiring to make way for new "IN Colors". Let me know if you want a new catalog and I'll tell you how to get one for free. Happy Birthday to you.... Dear Taab... Happy Birthday to You! Color Combo Challenge 2007-2008 "In colors"
The In colors for the last year are retiring as of August 10th. I received my new catalog today and the new IN colors are beautiful. The SCS Color Combo Challenge this week was to use the retiring colors. I choose Purely Pomegranate and Wild Washbi. The stamp is from a new hostess set called Deer Friends. I was so excited to get my new catalog. You won't believe all the new and really cool stuff. Email or call me it you need a new catalog. August 11th is just 6 days away. Oh, if you want to see the challenge on SCS click on the title of this post. Today I want to show you one of my favorite cards to make. I saw this basic demonstration several years ago at one of the first stamping events I attended. They are fairly simple cards, that's why I like them. On this card using the scallop punch, I punched out a shape on the front of the card. Then I stamped the little pig on White card stock and punched it out also with the scallop punch. I then position the White scallop inside the card showing through. I pierced the center of the scallops with the paper piercer and added a little piece of ribbon. Viola! You can use any punch, square, round, oval ,tag whatever best suits your image. Speaking of images-unfortunately, this cute little Pig is retired. I love him. This card was for Haley's first birthday from Cadence. Cadence, i.e. Cadie, gave Haley a Mushybelly Pig for her Birthday, so we needed the Piggy card. I made the cutest little bag out of DSP (still working on using up the retiring paper) to match the Birthday card I made for one of my babies. 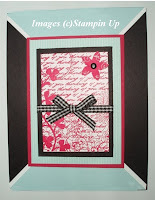 I found At "Stamping with Di" Just click on the title and it will link you to her tutorial. It was not difficult. I used Cutie Pie DSP with Whisper White and Pretty in Pink Cardstock, new scallop edge punch, the 5-petal punch, round tab punch, 1/4 inch hole punch and a button. The button has a sliver of paper threaded through it like thread. I hope you like it. It was fun to make. If you are interested in learning to make these email me and I'll set up a class for you. This is the Day the Lord has made, Rejoice in it! Good Morning. It's an early day for us. We have to been at church this am before 8:( I am not a morning person and it takes us 35-40 minutes to get there hence the title of this post. 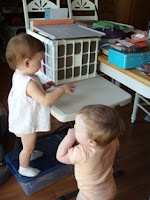 The card I'm sharing today is for Cadence's (g'baby) best bud and playmate's first birthday. I'm still using old favorites that are soon to be gone forever. Cardstock: Purely Pomegranate, Pretty in Pink, Whisper White and DSP Cutie Pie (love that paper!) Ink: Purely Pomegranate, Pretty in Pink, and Bashful Blue Stamps: Zoofari , Sock Monkey and For a Friend. The rhino is on dimensional with a piece of faux ribbon from the balloon in her mouth. The ribbon is from the RO set Sherbet. This was fun making. Remember you only have a few more days to order retiring paper, stamps and ribbon. 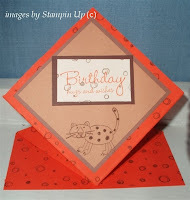 Well, I do have another card to post, however my biggest challenge this week has definitely been learning about blogs. I have spent way to much time playing on the computer without alot of results. But again, this is a new learning experience for me and I'll keep on trying. I created this card for a demo in my group. It is an anniversary card. Happy Anniversary Crystal! I hope you like the card. It was for a SCS card sketch challenge however, I stuck with the color combo challenge from the day before. I never really liked Groovy Guava-but with the Sahara Sand and Whisper White it looks pretty good. I did use the *New* "In Color" Tangerine Tango ink. It worked well. So get busy and use up all those old colors the new ones are on there way soon. This stamp set is called Fresh Cuts, it is also in the new Cattie. Just a few more days- I can't wait to get my hands on that book! I have really become hooked on challenges. 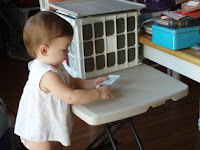 Stamping challenges that is, not the everyday life ones. This past week I did several: a new technique challenge, color combo challenge, card sketch and limited supply challenge. 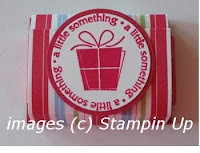 These are all posted at http://www.splitcoaststampers.com/ It was addicting. I stayed up late in hopes of catching the post as soon as the new challenge was given. Here are some of my cards from this week. These two cards were for the limited supplies challenge on Thursday. The challenge was to use scraps. I have tons of scraps. I hate to throw away all those little little over pieces of paper. So this was great. 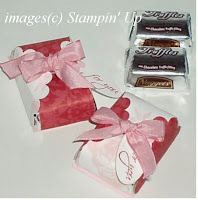 The stamp set is Enjoy every Moment, the cardstock Creamy Caramel, Chocolate Chip and Very Vanilla. 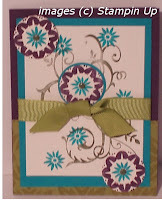 This card is made with Basic Black , Tempting Turquoise, Whisper White and So Saffron. The DSP is Petals and Paisleys. The stamp is Polka Dots and Paisleys. I used White craft ink on the black cardstock and Turquoise on the So Saffron. Oh, I almost forgot I used my brand new scallop punch for the edge. Love that punch! Don't forgot the brad. Welcome to my new adventure. I must be out of my mind or it's that mid-life crisis I've been hearing about for several years,but as my next birthday approaches I find myself doing more and more unusual, just plain wacky things. This is one of them. I am starting a blog. I am not very computer savvy so this is a big stretch. I have enjoyed being a Stamping Up demo for just over 18 months, however I have been mostly a hobbyist with a little workshop here or there. Now I am ready to hit the floor full force. I love to stamp. I love the reactions I get to my cards when I give one to a friend. I love the fact that even though I don't possess a great deal of artistic talent, I can create beautiful images with stamps. I want to share this fun with others who might get the same amount of pleasure I do from stamping. I have become very close to some awesome ladies I scrapbook and stamp with. They provide excellent therapy! I hope you will visit my site and enjoy my cards , ideas, and maybe a little ranting. Leave me a message, I love a pat on the back. Soon I will don my red hat and wear it proudly.